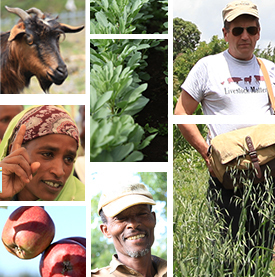 The sixth issue of Forages for the Future newsletter features the Africa RISING project’s efforts in exploring new ways of integrating multi-purpose forages to increase the feed quantity and quality available for livestock in mixed crop-livestock farming systems in Ethiopia. One of the farmers who have benefited from tree lucern (photo credit:ILRI\Simret Yasabu). The main article highlights the multi-purpose tree, tree lucerne or Tagasaste, which the Africa RISING project in the Ethiopian highlands has been researching and promoting to fill the gaps in terms of feed quantity and quality in research that is led by the International Livestock Research Institute (ILRI). 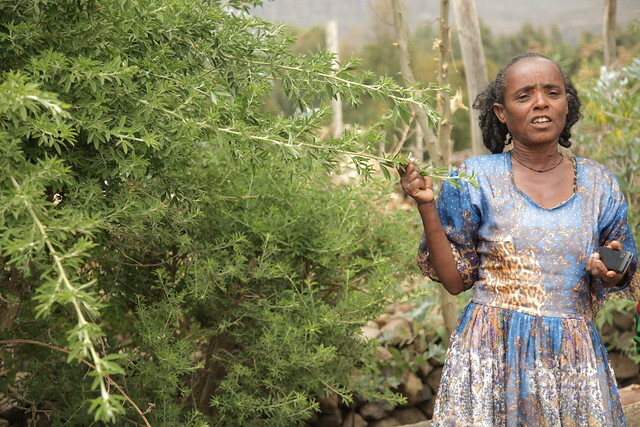 The results from first phase shows the high potential of this multi-purpose tree in addressing the feed-related challenges experienced by farmers in the highlands of Ethiopia. Download the Forages for the Future–Issue 6 newsletter. Tags: Forages for the Future, newsletter. Bookmark the permalink. A key problem for fodder tree legumes are establishing enough also by small farmers. I developed, documented and published improved low-cost solutions making direct seeding easy and reliable without transplanting. Better management is possible too.